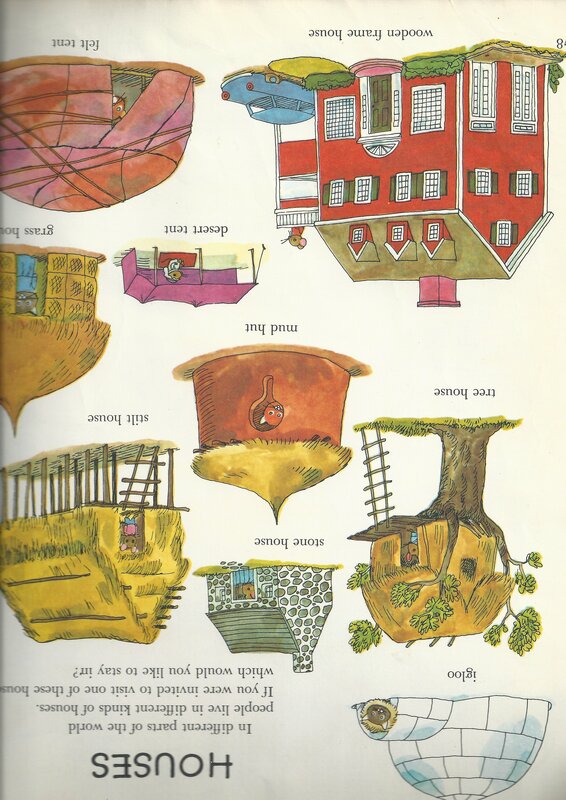 I didn’t know Richard Scarry was a person. 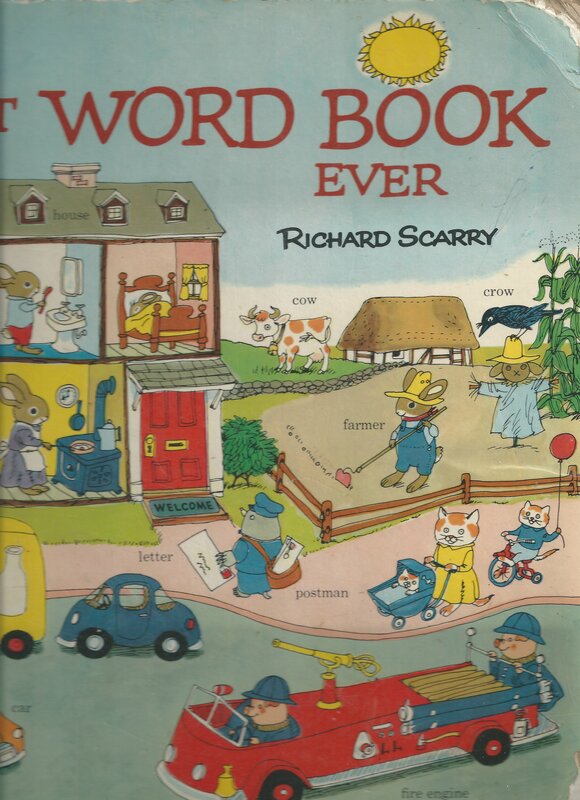 I was a huge fan of The Busy World of Richard Scarry. I always thought that was a weird title for a tv show. It was educational and entertaining at the same time. I loved it when they focused on a family in another country, like Italy. The animation was very detailed as well, something I believe is missing from digital animations. 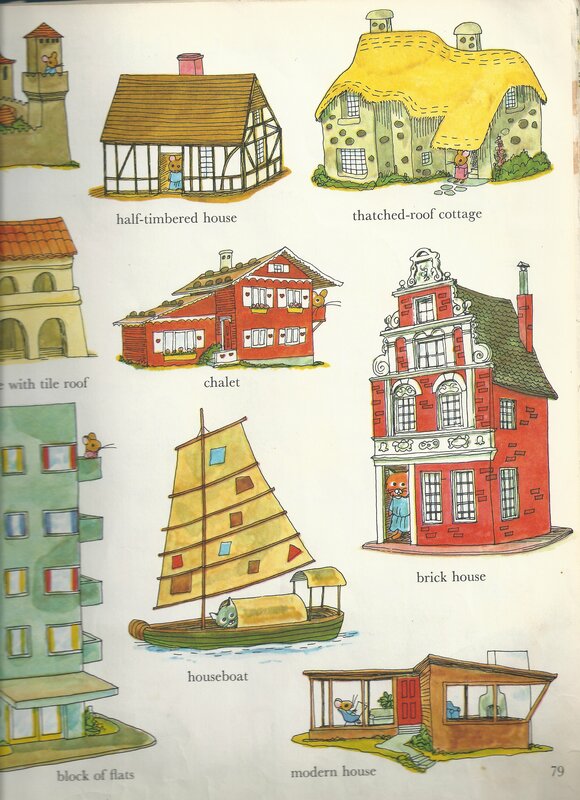 I seem to have forgotten than Richard Scarry wrote and illustrated Best Word Book Ever. That’s the actual name. I have the original copy! With stereotypes and missing pages from the new editions! But yes I used to flick through the book all the time. Sometimes even copying a picture of the flowers. I learnt . . . Different types of toys and games from the 60s. Everything is more innocent and fun if everybody was an animal. I want to be an illustrator so bad. When I was flicking through the pages, I wanted to cry because I felt like I was seven. It’s really peaceful to just stare at hundreds of images on a page. Before there was Disney Pixar’s Monsters Inc. , there was Nickelodean’s Aaahh!!! Real Monsters from 1994. No matter how many times I type it, I don’t think I will ever remember how to spell Nickelodean off by heart. Actually I’ve never been a very good speller so thankfully I wasn’t forced to participate in spelling bees and– hold on. I’m getting off track. So yeah . . . Can you believe that this is the actual title of the show? I can’t settle on whether it’s the most simplest or creative title ever for a cartoon. The opening and ending credits of the show is just like the Rugrats but the animation style is more Wild Thornberrys; also created in the 90s. What’s the difference between Rugrats-The Wild Thorberrys and Aaahh!!! Real Monsters (ARM)? The other two got a movie. TWT did not deserve a movie! It wasn’t such a great television program to begin with. At least ARM got their own video game, which I have played. It’s not easy. 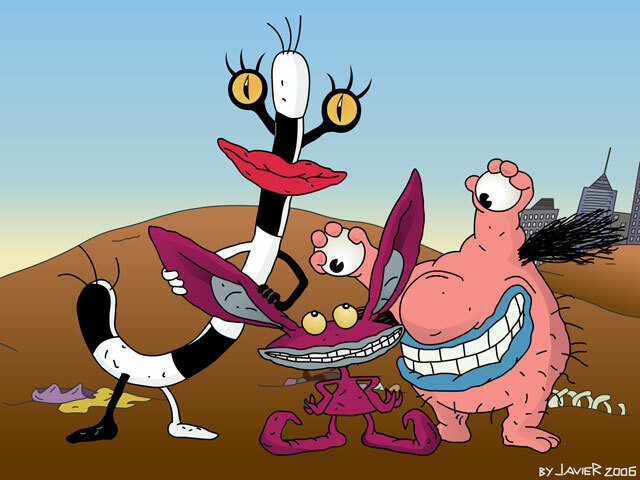 The show centers around three best friends; Oblina, Ickis (got that from Icky, I guess), and Krumm. 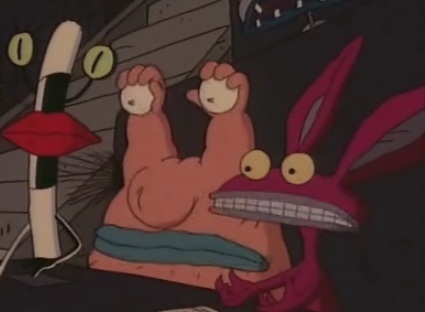 Oblina looks like a candy cane, Ickis looks like a rabit, and Krumm looks like a tubby man without a head and other . . . missing . . . parts . . . The kids go to Monster School where their life’s mission is to scare the living crap out of human beings. The school is lead by The Gromble. This green monster is flamboyant, strict, crazy, wears red heels on each of his feet, and is so entertaining to watch. Take notes guys. The Gromble is crazy but wise. The standout episode of the show has to be when Krumble gets a giant pimple on top where his neck should be. The students are mezmerized by its ugliness which is fantastic in monster mind. This is no ordinary pimple, it grows a face and disgusting personality. I couldn’t stand it. 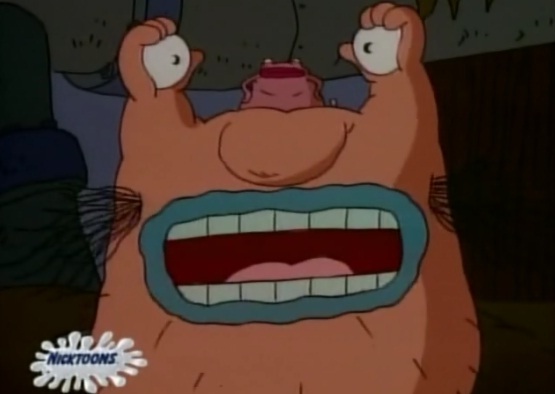 As a child it was such a creepy episode to watch to have a ugly living lump on your face! Instead of shrinking back into the skin, the pimple pulls its legs out of Krumble and runs off. Shivers! That thing deserved to be popped! I must say that ARM is probably Nickelodean’s most underated and forgotten series. I’m older now, but after rewatching the episodes, it can still be enjoyed by older people. I’ve been trying to watch the Might Morphin’ Power Rangers and may I stress on the work ‘trying’. It shocks me sometimes at how much I loved it as a kid. So Nickelodean . . . where’s my DVD? Londale Mall is celebrating Christmas in August! 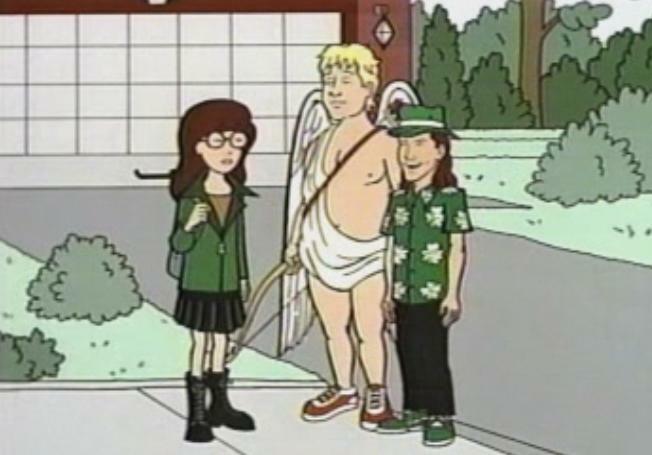 Daria is stopped by cupid (Valentines Day) and leprecaun (St Patrick’s Day) who are on a secret mission. Christmas, Halloween and Guy Fawkes Day have left Holiday Island to Londale to start a band, of all places. 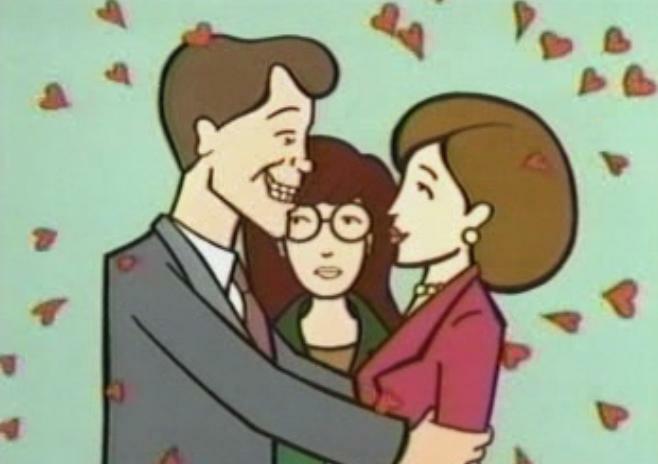 Daria returns home where her parents are already arguing. Cubid and leprecaun want the parents to shut it so Daria can help them. Cubid shoots them with a razer looking arrow shooters (I see Holiday Island is up to date with their technology) and the parents are blissfully horny for each other. Christmas, Halloween and Guy Fawkes Day comes over to jam at Trent’s house. Christmas is a cute blonde teenager. Halloween is a gothic chick and Gyfox is a punk metal guy. Neither of them want to return to Holiday Island because who would want to be jolly twenty four hours a day? Quinn thinks her parents are trying to have a baby because she catches them making out and making happy noises in their bedrooms. She must stop them, even if she doesn’t get any sleep. Life has come to a halt without the most celebrated Holidays. Daria and Jane visit Holiday Island. All the Holidays are high school students! 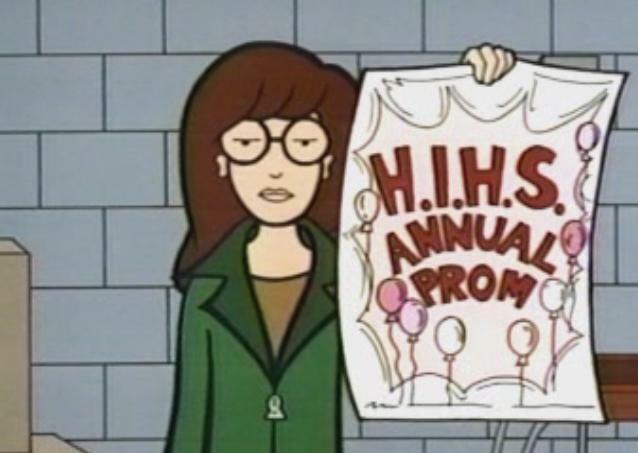 Daria and Jane decide to help get Christmas, Halloween and Guy Fawkes Day to return to Holiday Island once they find out Presidents’ Days are ruling the school. Patriotic? Pa-leez. The holiday day band are offered a gig at H. I. High School prom. When they find out who the new leaders of the school are, they quickly take over. Okay, this wasn’t such a Christmasy episode, but I don’t really care at this point. I’m too tired. 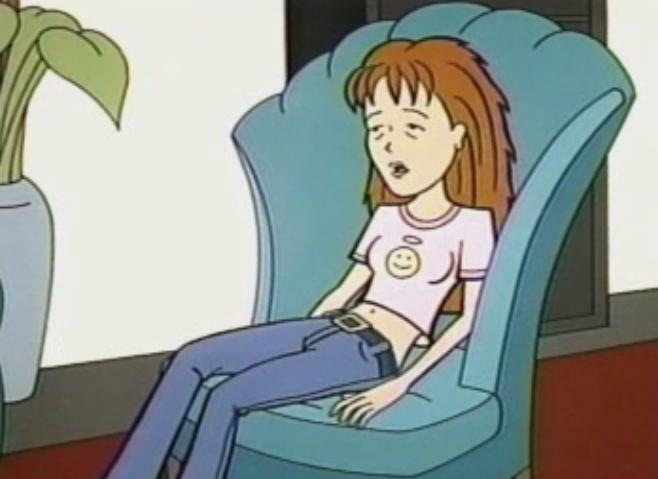 Leprecaun: You see Daria, you really had a wonderful life. 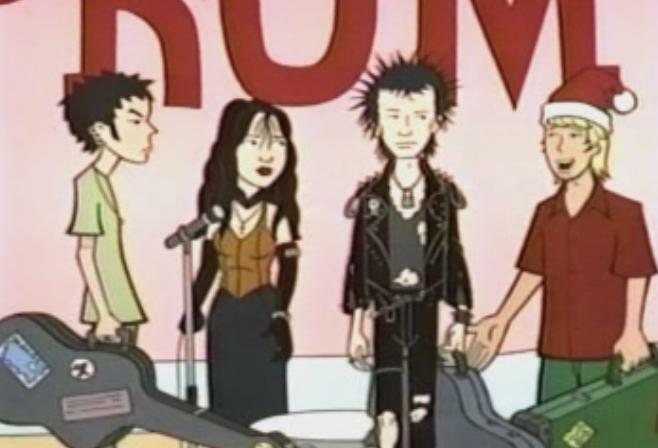 Daria: What the hell are you talking about? I think this will be a short post because there’s not much I can say. This is not any animated television show, this is a REAL CARTOON! I was a young little girl so I hated it for being a CARTOON. Why did they have to exaggerate everthing? 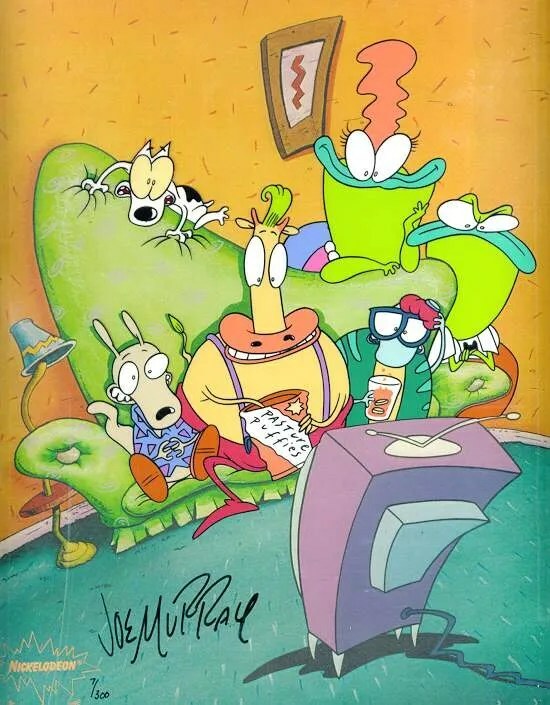 How come everything was going wrong for Rocko? Can’t there be an episode where it wasn’t so tragic and irritating for him, because it irritated me. Well after not watching it for a year, I really missed the show and realized that it was really funny. When it came back on I quickly grabbed a video cassette and pressed record on my video player. Rocko was an immigrant wallaby from Australia (in case you don’t know where wallabies come from) and was trying to live his new modern life in America. His best friend Heffer was a very famished steer and his other friend was an anxious turtle, Filburt. Rocko had a pet dog, Spunky. I don’t understand how a wallaby can have a pet dog; but then again, it is a cartoon. This cartoon was filled with hundreds of wacky characters. The worst of them all were Rocko’s frog neighbours; Mr. and Mrs. Bighead. They were the freakiest and most annoying cartoon characters I have ever met, not to mention the ugliest. I have two favourite episodes I remember very clearly. The first one is based on Mr. and Mrs. Bighead’s son who was a director/producer/writer. He created his own shows. The thing was, he really hated his job and tried to make his tv shows as bad as he could so that they would fire him. He even made a whole episode of a pickle jar just sitting in the corner (or some other jar of something) and he gained even more views! That was hilarious. So the son thought of a great idea of making Rocko, Heffer, and Filburt create an episode for him, they are bound to think of something really bad. In the end Rocko convinced the son that he should be trying to make his shows the best and put a lot of effort into them. The son was persuaded and put a lot of effort into his next show, but the audience hated it and he was fired. How ironic huh? The other one was when Heffer, Filburt, and Rocko had to take care of Filburt’s unhatched egg. This show was full of laughs. I taped over the episodes I recorded. I wish I didn’t but I was running out of tapes. You can watch some episodes on youtube though. Hooray. On the IMDB forum, someone said that Rocko’s Modern Life might be released on DVD this year in 2008. Another hooray! See. . . told you it’s a short post– for a tv show I mean. Credit to xXwhitexshadowXx for the video.